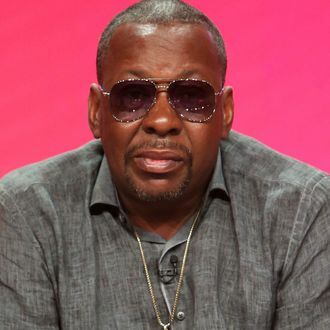 Bobby Brown authorized production of The Bobby Brown Show, the sequel to BET’s The New Edition Story, because he wants people to know he isn’t the “bad boy” that he depicts onstage. But at a Television Critics Association press tour panel on Friday, Brown disputed several documented facts regarding domestic-violence incidents between himself and his late ex-wife Whitney Houston. After saying that he doesn’t have regrets in his life, though he does “feel bad” about some of the choices he’s made, Brown was asked by a reporter at the TCA panel if that belief extends to the incidents of domestic violence witnessed by his late daughter, Bobbi Kristina. “There was no violent incidents between me and Whitney so, no,” Brown replied curtly. The reporter pressed on, adding that Houston called 911 to report that Brown physically hurt her. A BET rep promptly ended the session, then canceled the five-minute press scrum with Brown and the Bobby Brown Story actors that was scheduled to take place on stage.